Strategically located close to the Jaisalmer Airport by 3kms, this 3 Star hotel at Ramgarh Road maintains 40 air-conditioned rooms. Guests can relish on some multi-cuisine fare at the in-house restaurant, which also serves an array of Continental and Indian fare, besides authentic Rajasthani delicacies. There is also a watering hole by the name of Sunset Terrace, which is well-stocked with Indian and imported spirits. A dip in the outdoor pool is one of the rejuvenating options available for the guests. Room Service, Currency Exchange, Airport Transportation, Breakfast Services, Laundry Facilities, Backup Generator, Travel Counter, Security Guard, Doctor on Call, Parking. , Attached Bathroom, Iron/Ironing Board, H/C Water, Cable/Satellite TV, House Keeping, DVD Player, Toothbrush/Razor on , Air Conditioning Room. 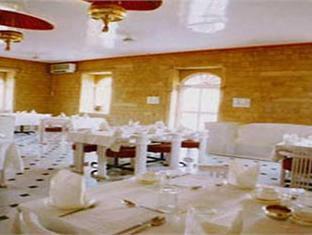 User reviews for "Himmatgarh Palace Hotel Jaisalmer"